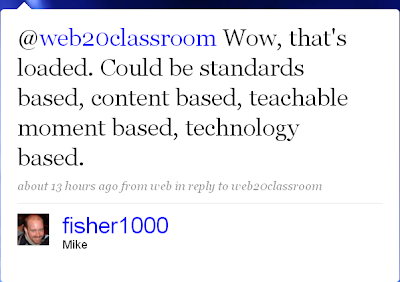 Blogging About The Web 2.0 Connected Classroom: What Makes A Great Objectve? What Makes A Great Objectve? 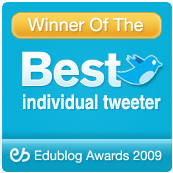 On Twitter this evening I participated in the weekly #edchat. (You might remember my reference from my previous post. If not, check this out.) This weeks topic: What Objectives Are Necessary For Effective Technology Integration? What I love about these sessions is that while we have a topic that we talk about, the conversation ultimately expands in to something totally different. And that is precisely what happened tonight. -I work as a medical school clerkship director. Good objectives for me have to have to have must be clear, and focused with an implicitly measurable outcome. It should have flexibility for the learner to be able to attain it in their own unique fashion, and be able to apply their own unique educational needs in achieving the objective. (i.e. a future ear/nose/throat doctor will need to focus more on head and neck neuroanatomy than a future obstetrician). -Great learning objectives must focus on content, not on individual tools that may or may not even be viable in a few years. -Demonstrate understanding of concepts and be able to apply them to different and new situations. Be able to discern and communicate how concepts differ and / or are similar. Be able to communicate how concepts fit together in hierarchy - with bigger things and smaller things. -I teach HS English and my most frequent objectives include thinking processes like "synthesizing" info (from multiple texts/genres - can include visual/audio materials) and making connections to external ideas/materials (students find own connections and bring in) to keep things relevant. Also analyzing/questioning as these are life skills and critical to actually understanding these materials. -I use the ABCD model: Audience, Behavior, Conditions, Degree. This format requires verbs such as generate, analyze, explain, estimate, produce, solve, indicate, design, compare......in the Behavior section & a percentage or range of accuracy in the Degree section. -The demonstration of multiple tasks and skills on a student requested project where the incorrect use or omission of any(skill)assures limited success and a revisit by the choice of the students until they are successful. Verbs-Build, Fabricate, Calculate, Design, Redesign. 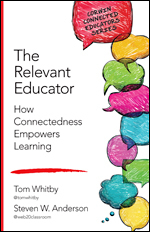 -I encourage teachers to include the skills (know and be able to do) elements rather than the specific content knowledge and point them toward the verbs that promote application, analysis, evaluation and creativity. These are just a few of the amazing comments that were made. You can see the entire list here. My summary- These educators get it! Objectives have to be clear. There as to be a specific goal in mind, not something general or abstract. The other thing that these posts and other comments made was that the tech is not the objective. The tech is the tool to reach the goal of the objective. For me, that was the most important realization that came out of the conversation. If you didn't know, I was a Middle School Science teacher for 6 years before leaving the classroom. I have had my fair share of technology staff developments. The vast majority of these were about the tool. How to use X tool. All the in's and out's. Ok, for someone like me, who lives, eats, and breathes this stuff, that is awesome. I want to know EVERYTHING I can do with a tech tool. But for your average teacher, it was way too much information. I (and most edtech innovators I talk to) know that the true way to get tech in our classrooms and in the hands of our students is to show the tool, but more importantly, how is that too used to teach. If I am doing some PD on using an Interactive Whiteboard (IWB) I focus on basics, because for most of the teachers that are there the IWB is a completely different way of teaching than what they are used to. I want to give them just enough to use the basics of the board but spend the majority of the time on talking about and brainstorming easy ways to use it in their teaching. Now that is not to say there is not follow-up PD on more advanced features. The goal is to get the tech in the hands of the teachers and students and show them how it enhances learning. Back to objectives, many people also said that there should also be choices in the completion of the objective. 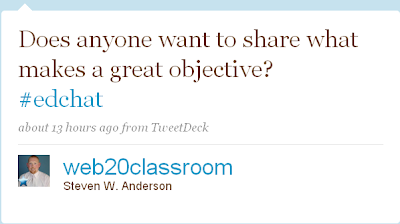 During the course of the conversation one innovator posted a sample objective using a specific type of tool. Others added that there were other tools that were equally as good that could also show learning. This is a great point. We know about the Multiple Intelligences and we know that each students learns differently. So why not let them demonstrate their learning in different ways? It was an amazing conversation! I wish I could post the entire conversation. At last check there were over 900 tweets in just about 3 hours. If you didn't join us this week remember, we are on every Tuesday at 7pm EST. Oh and you can read the archive, tweet by tweet here. 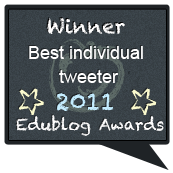 You can also check out previous edchats by visiting my Delicious Page. Great overview of important points! I really enjoyed the reading responses you included in nice chart. I think you are right that teachers must be taught how to teach with the tool, especially those who are not used to various presentation tools. Too many would just use these tools to substantiate a lecture, when the purpose is to differentiate instruction and engage learners. Just went through the educhat transcript. Thanks for hosting the discussion and hope to join the next discussion next week.